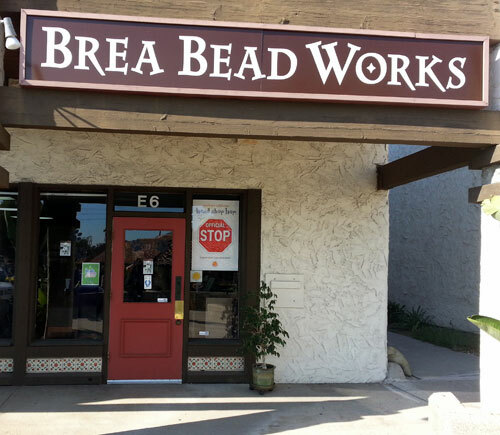 After leaving Chino to go West, our second stop was at Brea Bead Works in Brea. This was another store completely new to me and that is the worst possible thing you can do to a Bead Whore’s pocketbook, believe me! Tucked in a largish strip mall right off the 57 freeway, you can’t beat it for convenience. Fairly certain nothing could beat seeing a pony today in Chino, I was still taken aback when the greeter said we were going to do some trivia to start with, opened a book and it started yelling, “WHO LET THE DOGS OUT!! !” at me. I had to laugh at the song, being completely unfamiliar with their theme book being “Marley and Me”. So this place is about canines today. Okay, I get it now. 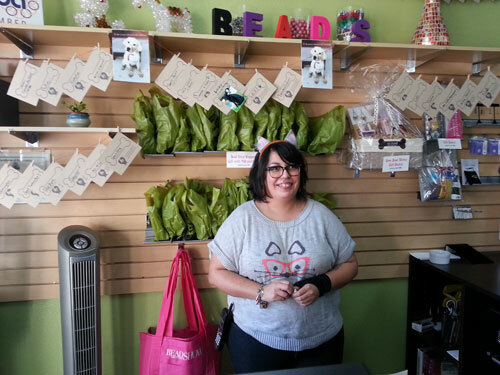 I really like this little store – it is well laid out and has a nice variety of anything a bead whore like me would want. The first thing I saw were the tools and remembered my need for a hammer for tempering jump rings – something I want to experiment with. Plastic vs. rubber mallets…they had only plastic and the store greeter was very helpful with advice on what to use and if it would work with what I wanted to do. The wall of seed beads called me next, as they always do. Frosted autumn colors and Halloween orange caught my eye, as well as some smaller tubes of purple iridescent drops and super duos. Heaven knows I haven’t decided what I’m going to do with all these duos yet – I have an inkling, but until I sit down to do it, I seem determined to collect all the shiny colors I can get my hands on as well as check out what is available locally. 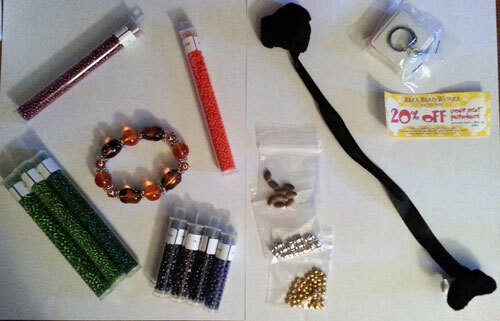 I NEVER buy seed beads online and wouldn’t unless I had an exact item number. Do not trust the colors as interpreted on your computer monitor – they are NEVER completely accurate! Oh and one more thing before the stats – even though their theme is dogs, I HAD to buy a cat bead bracelet #1 because it is so cute and #2 because it is for a good cause. Oh, and it’s in Halloween colors, too. 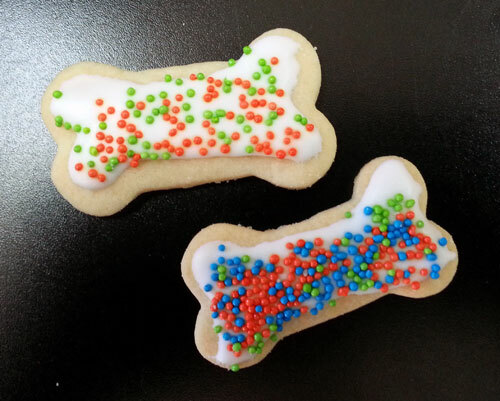 Homemade sugar cookies that morning by the owner. They were very good and I am liking this store more and more now! Right panel: the giveaway goodies for coming in and handing them my credit card: a fuzzy, black dog bookmark, portable measuring tape, a coupon for 20% off the next purchase in the next two months and 3 packs of metal spacer beads. Of the two stores way out here in the sticks (as far as my house is concerned), I would definitely make an effort to come back to Brea Bead Works if I started a project with their beads. Then I would take the half hour and go back East to Bead It! to have a slice of pizza and chat with the locals – even if the pony isn’t still there. Thank you Brea for a great experience in miserable, triple digit conditions! 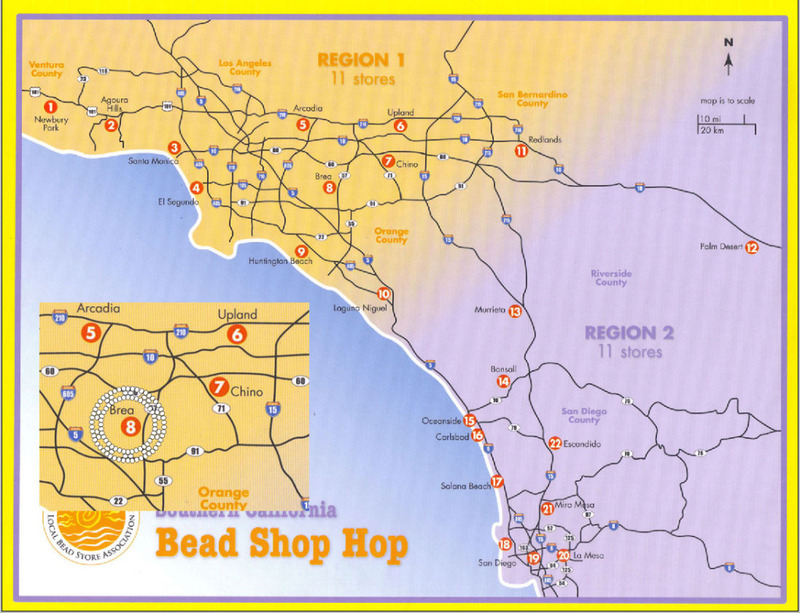 Next – either Beadahs in Santa Monica or a progress report on my beading – better get to it so I have something to report! How about planting some of those seed beads and grow your own so you don’t have to spend all OUR money?